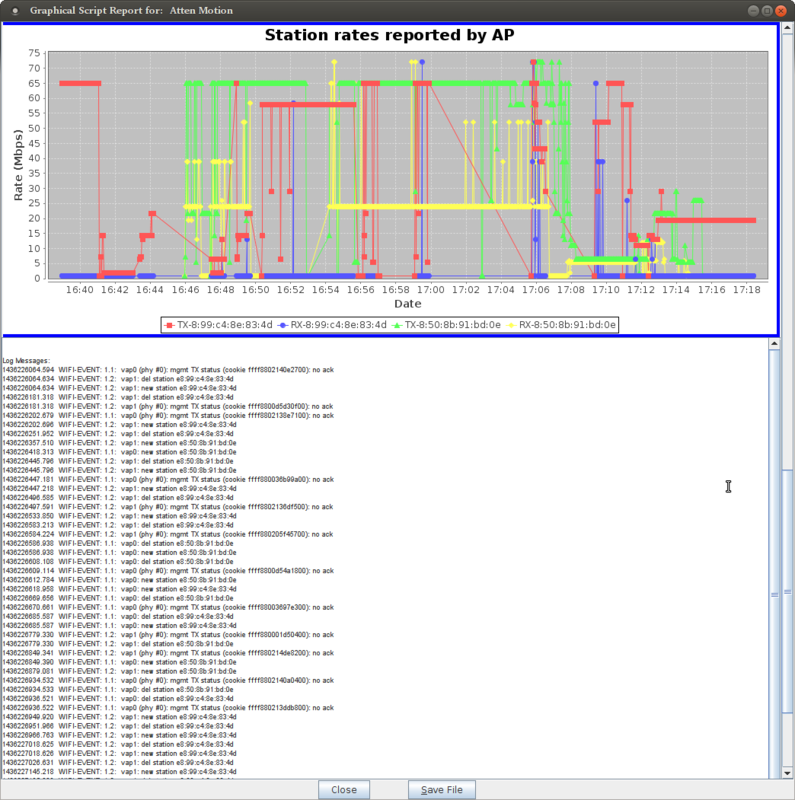 Goal: Test the AP migration of a station by changing the attenuation of two or more APs. By changing the apparent distance of multiple APs, we provide an environment that emulates moving through a series of AP coverage areas. We can set the rate of change to emulate the speed of the station's movement. We can set the emulated distance for APs so it appears that the APs are further apart or closer together. 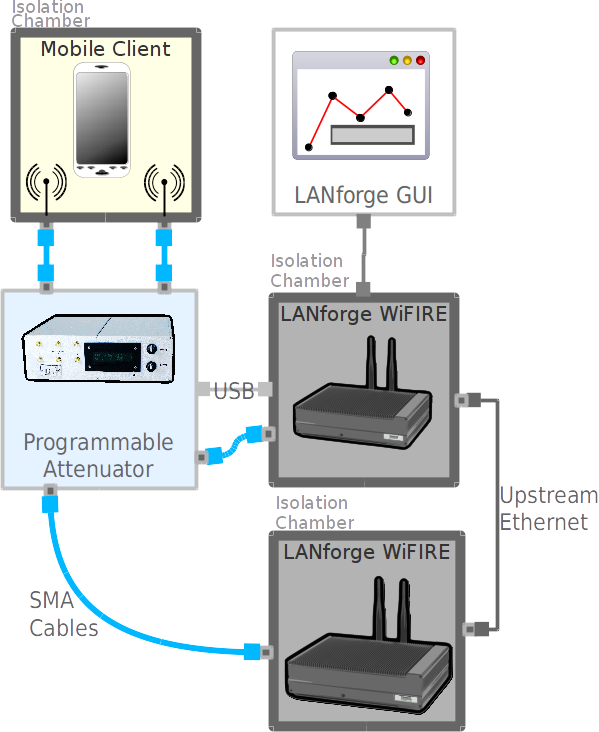 It is possible to use third-party access points, but then the LANforge would not be able to report as many statistics, and would be used mostly for just operating the programmable attenuator(s). Third-party APs may be able to provide their own reporting to make this scenario more useful. Setup two LANforge units. 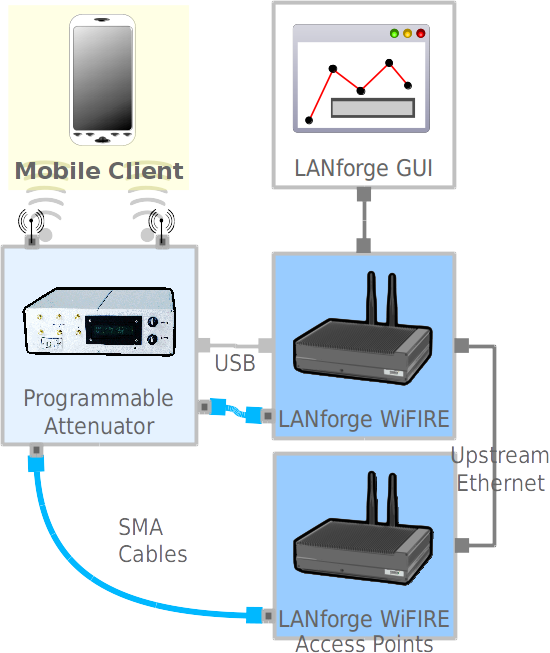 The LANforge manager unit will connect to a CT703 attenuator via USB cable for control and provide a virtual AP. The LANforce resource unit will provide a second AP isolated from the first. 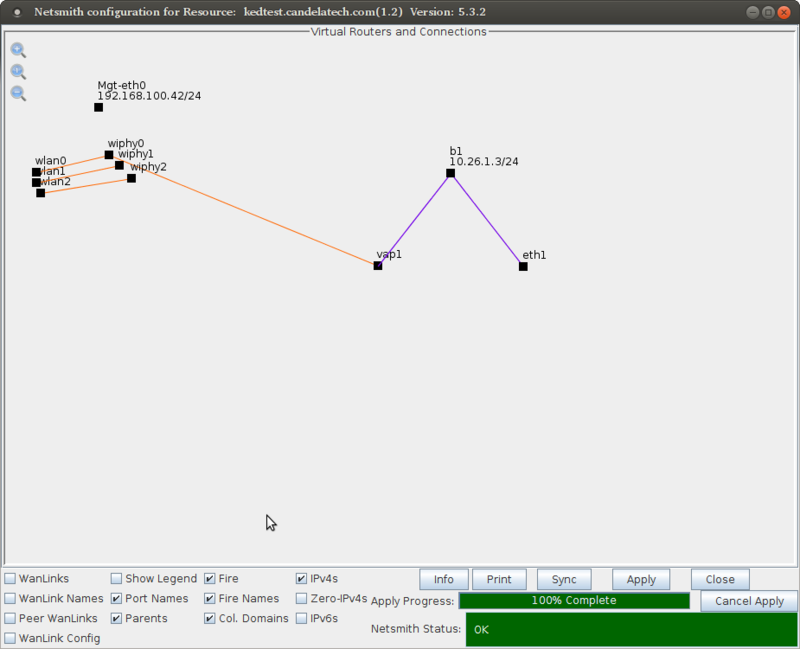 In Ports tab, On Manager resource, Create bridge b0 and add eth1 to it. 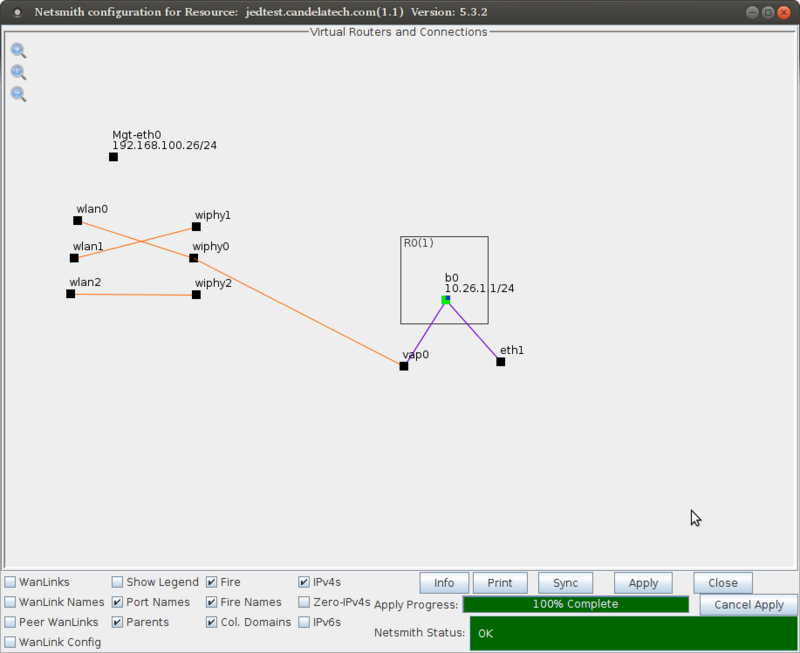 In Netsmith, create a virtual router. Right click → Modify b0 in the router, and enable DHCP. Create a DHCP pool with time:1200, starting address: 10.26.1.20, ending address: 10.26.1.200. Click Apply, close window. Close Netsmith. and add eth1 to it. 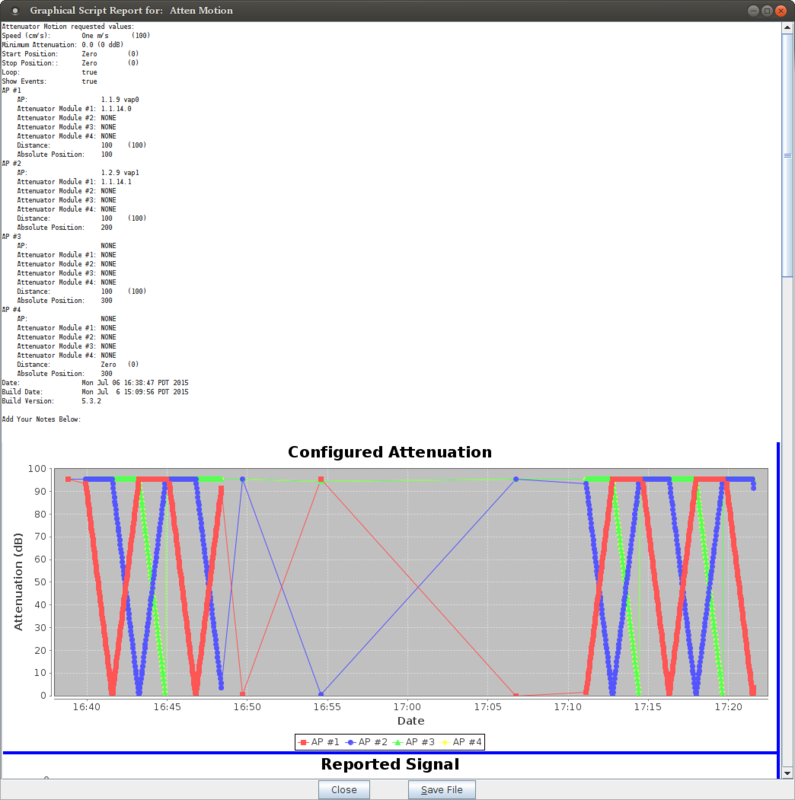 Open the Attenuator Motion plugin and configure a scenario. In this scenario, our attenuator is numbered 1.1.14. Change Minimum attenuation to 0.0 because we're doing an over-the-air test. You would set a higher minimum when cabling directly to the client station. Specify the first attenuator module wired to manager radio wiphy0 as AP #1. Specify the second attenuator module wired to resource 2 radio wiphy0 as AP #2. AP #3 should be at Distance 100. AP #4 should be at Distance 0. Set Stop Position to Zero. Click Start and a report window will appear. The image below shows repeated looping and pausing, as well as some manual adjustment. Verify station associations. In the picture below, two cell phones are present for the test. They jump between AP ID 1.0 (AP #1) and ID 2.0 (AP #2). In our testing, it does not appear our phones do a good job of jumping to a higher quality AP when the signal to the current AP is weak. But, it will normally associate properly to the 'best' AP when it looses connection to the old AP. Drag the position slider to distance 100 to center the station under AP #1. Check that the phone associates with AP #1. Drag the position slider to distance 200 to center the station under AP #2. Enable phone WiFi connection, and check that phone associates with AP #2. Run looping test. 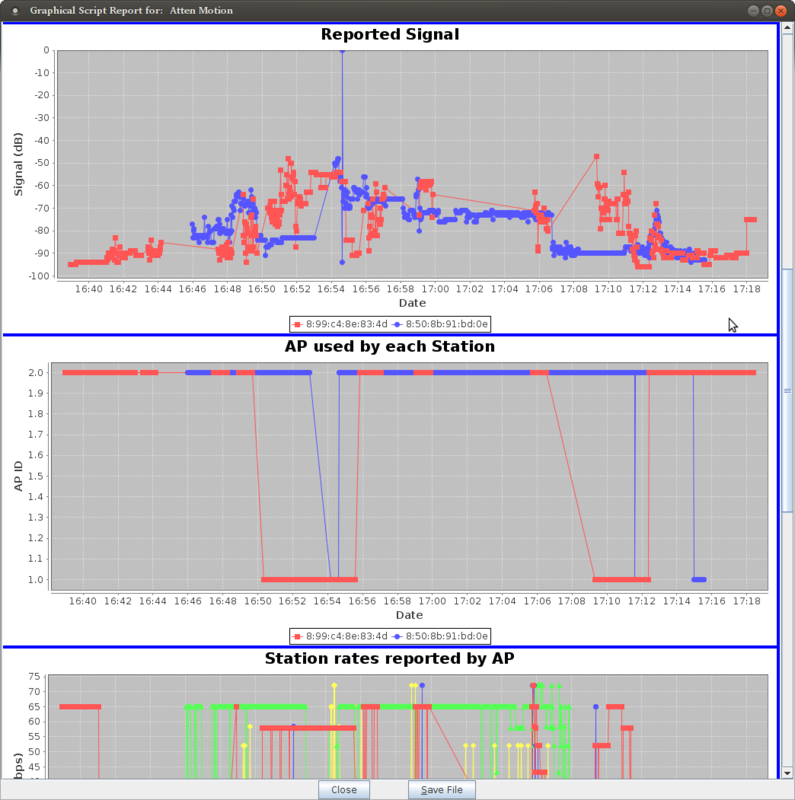 In graph Configured Attenuation above, and the Station rates reported by AP graph below, you can see that first cell phone had a difficult time associating to the APs while they were migrating: the reported TX and RX rates for it are zero or very sparse. A steady stream of data (fast ping, iperf download, etc) should be run to or from the phone (DUT) to ensure accurate tx/rx rate reports. That was not done in this scenario. During this test your phone will attempt to roam to anything. In your phone WiFi settings, force the phone to forget your nearby (non-testing) APs. You might have to change the WPA2 passwords kept in your phone WiFi settings for those nearby APs to force them to fail association with APs outside this test. Uncheck Pause and the test will resume automatic attenuation of each AP. At Candela Technologies, our testing showed our Android phones were not behaving optimally. Part of the problem is that we were not using isolation chambers, so even the 'out-of-range' APs were visible at around -80db signal level. We concluded that our phones were not smart enough to notice a weak AP and take proactive steps to scan for a better one.